Ethiopians who are studying in various Indian Universities in New Delhi introduces their culture to the Indians and to foreigners living in Delhi. Students of more than 22 countries have presented their cultural music On November 11, 2013 on an event organized to celebrate "Indian students day" to commemorate the birth anniversary ofMaulana Abdul Kalam Azad founder president of Indian council for Cultural Relations. The day was colorfully celebrated under the motto of "friendship through cultue" and students have shown their respective music and dances. 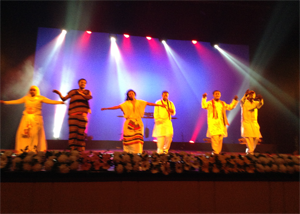 The Ethiopian students dance group have presented the music and dances of Ethiopian nations and nationalities.